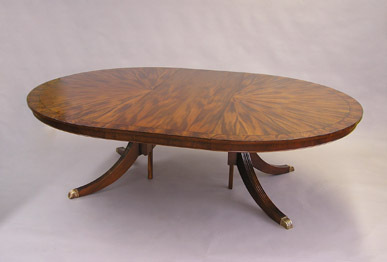 This split pedestal dining table opens to accept one or two 24” leaves, expanding from the 72” round in the closed position to 120” with both leaves. 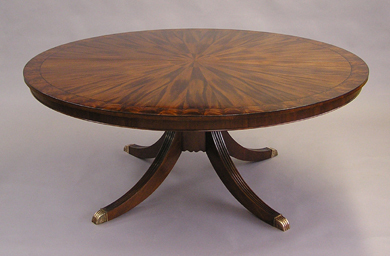 The top is hand planed solid mahogany, veneered with well-figured mahogany in a sunburst pattern. An inlaid ebony line and solid ebony edge banding help define the crotch mahogany cross banding at the table’s edge. Reeded legs are dovetailed to a turned split column and gracefully terminate into custom made brass sabots. The table is finished to a full pore satin sheen with waxed shellac.